Figure 1: Picket Boat No. 1 (1864). Engraved reproduction of a wash drawing by R.G. Skerrett, 1900. This craft, armed as a spar-torpedo launch, was used by Lieutenant William B. Cushing to sink the Confederate ironclad Albemarle on the night of 27-28 October 1864. US Naval Historical Center Photograph. Click on photograph for larger image. 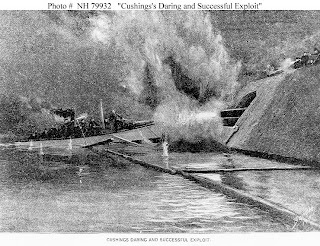 Figure 2: "Cushing's Torpedo Boat." Photograph of a general arrangement drawing of the boat and its spar torpedo. The original plan appears to be of 19th century vintage and is drawn on cloth. 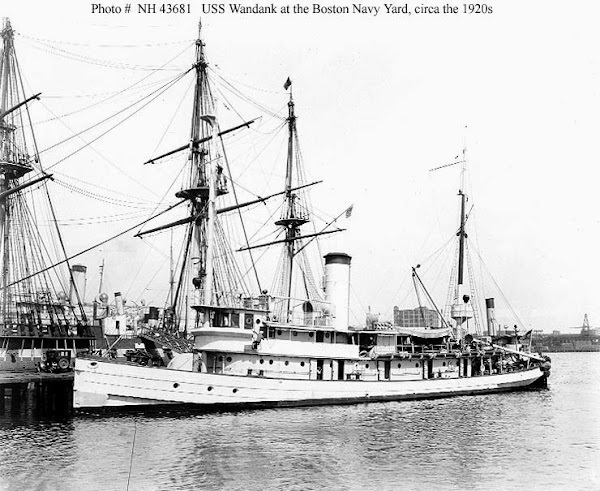 Lieutenant William B. Cushing used US Navy Picket Boat No. 1 to sink the Confederate ironclad Albemarle on the night of 27-28 October 1864. US Naval Historical Center Photograph. Click on photograph for larger image. 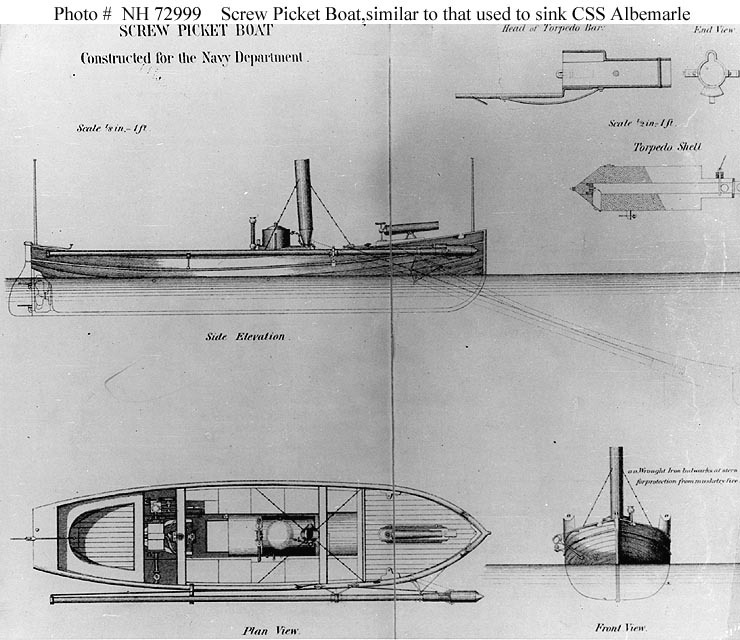 Figure 3: "Screw Picket Boat, Constructed for the Navy Department." General arrangement diagram published in Submarine Warfare, Offensive and Defensive, by Lieutenant Commander J.S. Barnes, USN, 1869. The drawing also includes detail drawings of the spar torpedo carried by this boat. This craft is similar to Picket Boat No. 1, which was used by Lieutenant William B. Cushing to sink the Confederate ironclad Albemarle on the night of 27-28 October 1864. US Naval Historical Center Photograph. Click on photograph for larger image. 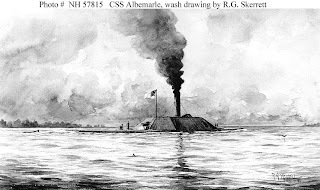 Figure 4: Sepia wash drawing of CSS Albemarle by R.G. Skerrett, 1899. Courtesy of the Navy Art Collection, Washington, DC. US Naval Historical Center Photograph. Click on photograph for larger image. Figure 5: Nineteenth century engraving of CSS Albemarle as she appeared "ready for action.” US Naval Historical Center Photograph. Click on photograph for larger image. 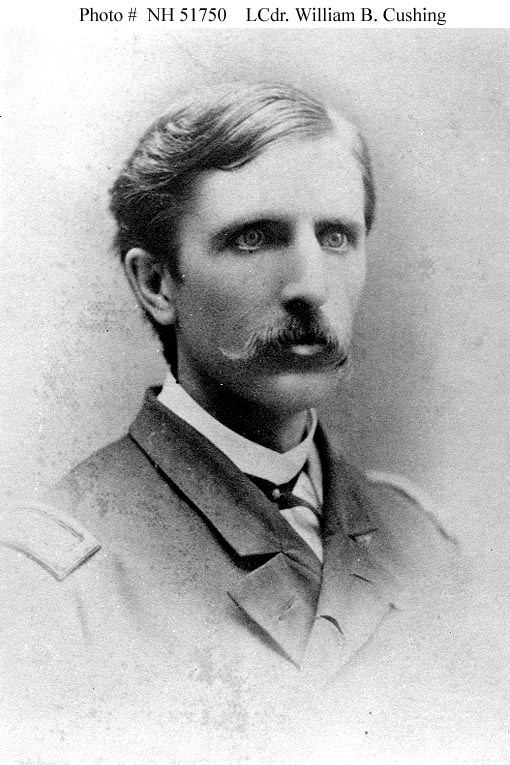 Figure 6: Lieutenant William B. Cushing, USN. Photograph taken circa 1864. The original photograph is in the collections of the US National Archives. US Naval Historical Center Photograph. Click on photograph for larger image. Figure 7: Lieutenant Commander William B. Cushing, USN. Halftone reproduction of a photograph taken circa 1864-1865. US Naval Historical Center Photograph. Click on photograph for larger image. Figure 8: "The Rebel Ram Attacking Federal Gun-Boats at Plymouth, North Carolina." Engraving published in Harper's Weekly, May 1864, depicting CSS Albemarle driving off USS Miami, after ramming and sinking USS Southfield (foreground), 19 April 1864. US Naval Historical Center Photograph. Click on photograph for larger image. Figure 9: "Wood versus Iron." Nineteenth century photograph of an artwork by Acting Second Engineer Alexander C. Stuart, USN, 1864. It shows CSS Albemarle engaging several Federal gunboats on Albemarle Sound, North Carolina, on 5 May 1864. USS Sassacus is in left center, ramming the Confederate ironclad. Other US Navy ships seen are (from left): Commodore Hull, Wyalusing and Mattabesett. The Confederate transport Bombshell, captured during the action, is in the right background. Albemarle was not significantly damaged during this action, which left Sassacus disabled by a hit in one of her boilers. Collection of Surgeon H.P. Babcock, presented by George R. Babcock, 1938. US Naval Historical Center Photograph. Click on photograph for larger image. 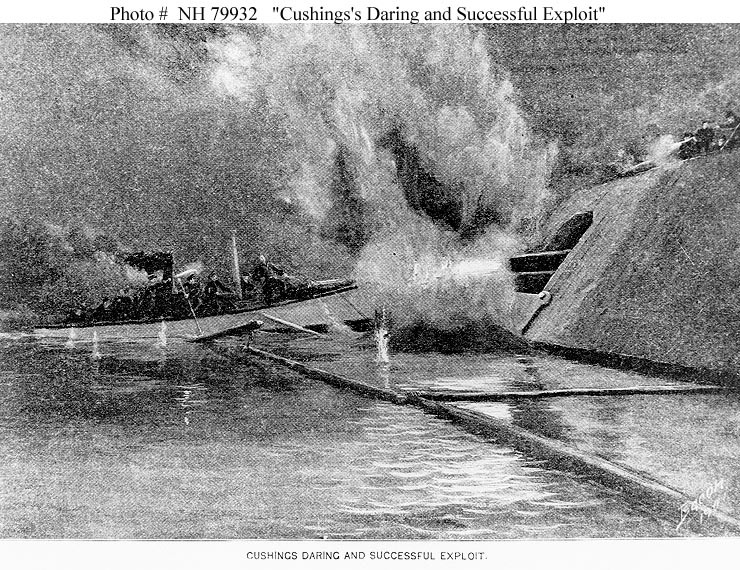 Figure 10: "Cushing’s Daring and Successful Exploit." Artwork by Bacon, published in Deeds of Valor, Volume II, page 74, by the Perrien-Keydel Company, Detroit, 1907. 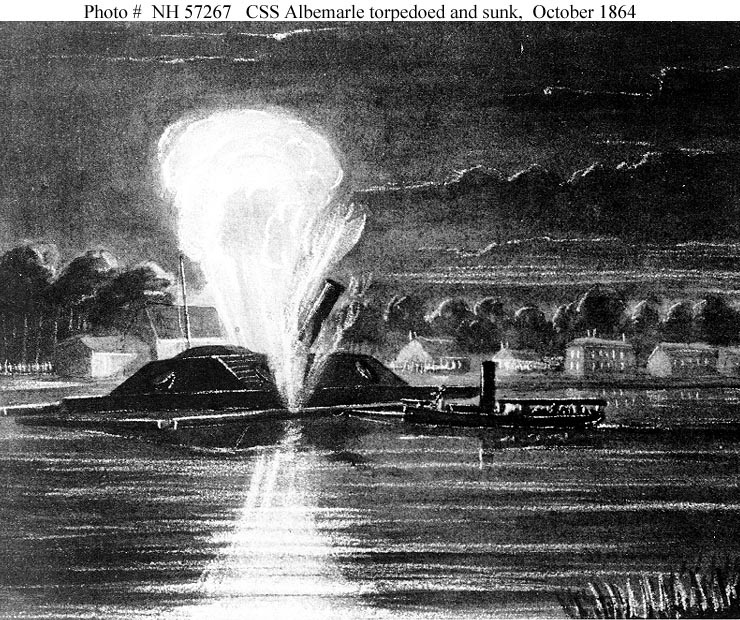 It depicts the attack on CSS Albemarle by a torpedo launch commanded by Lieutenant William B. Cushing, USN, at Plymouth, North Carolina, 27 October 1864. The torpedo boat is shown crashing over Albemarle's protective log boom to deliver its torpedo against the ironclad's hull. US Naval Historical Center Photograph. Click on photograph for larger image. 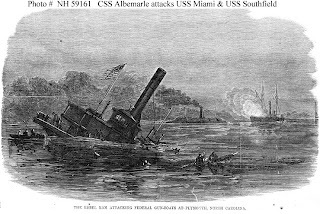 Figure 11: CSS Albemarle is torpedoed and sunk by Lieutenant William B. Cushing's torpedo launch at Plymouth, North Carolina, 27 October 1864. Phototype published by F. Gutekunst, Philadelphia, Pennsylvania, circa the later 19th century. Print from the Skerrett Collection, Bethlehem Steel Company Archives. US Naval Historical Center Photograph. Click on photograph for larger image. 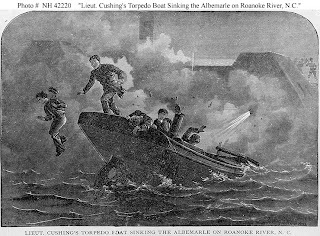 Figure 12: “Lieutenant Cushing's Torpedo Boat sinking the Albemarle on Roanoke River, N.C." Engraving by A. Stachic, published in Naval Battles of America, by E. Shippen. It depicts the successful spar torpedo attack by Lieutenant William B. Cushing and his crew on the Confederate ironclad Albemarle, at Plymouth, North Carolina, 27 October 1864. US Naval Historical Center Photograph. Click on photograph for larger image. 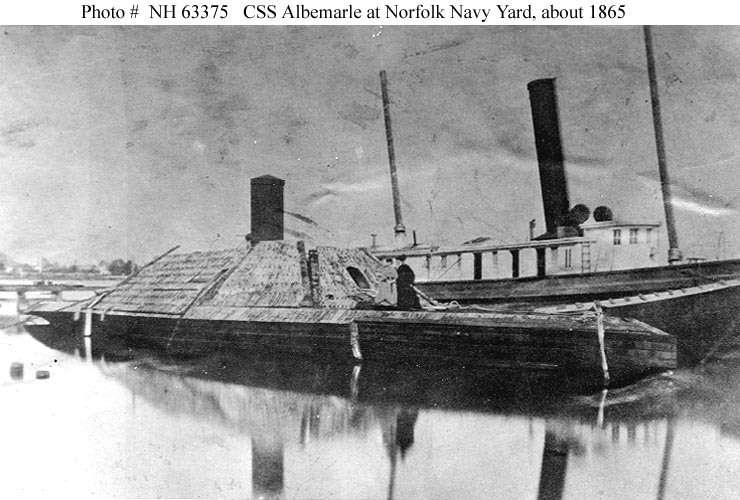 Figure 13: CSS Albemarle at the Norfolk Navy Yard, Virginia, after she was salvaged, circa 1865. Two ladies are standing on her deck, near a section of displaced casemate armor. Courtesy of Mr. J.C. Hanscom. US Naval Historical Center Photograph. Click on photograph for larger image. 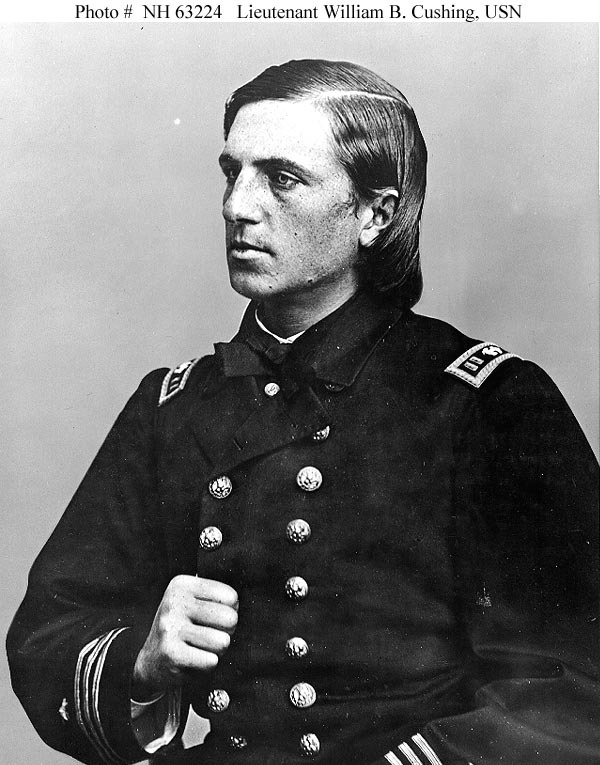 Figure 14: Lieutenant Commander William B. Cushing, USN. Photograph taken circa 1870, when he married Katherine Louise Forbes. Courtesy of Rear Admiral T.T. Craven, USN, 1935. US Naval Historical Center Photograph. Click on photograph for larger image. 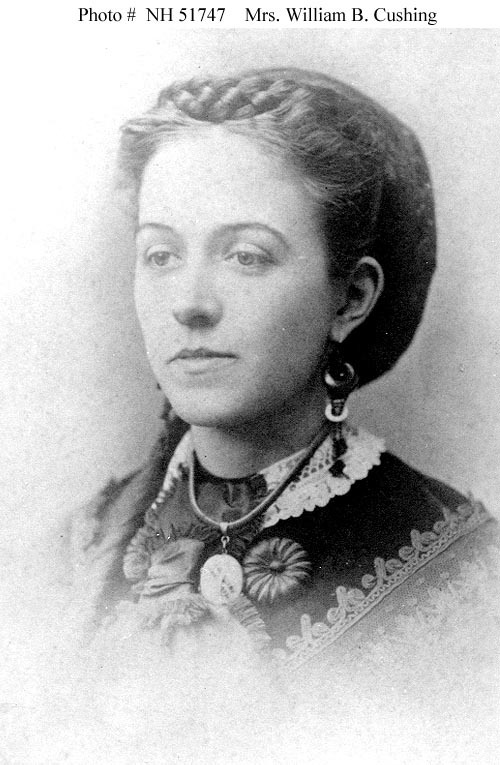 Figure 15: Katherine Louise Forbes Cushing, married to Lieutenant Commander William B. Cushing. Photograph taken circa 1870, when she married Lieutenant Commander Cushing. US Naval Historical Center Photograph. Click on photograph for larger image. Named after a town and a sound in North Carolina, and a county in Virginia, the 376-ton CSS Albemarle was an ironclad ram of the Confederate Navy and was built in a cornfield on the banks of the Roanoke River in North Carolina. The ship was commissioned in 1864 and was approximately 158 feet long and 35 feet wide, had a top speed of 4 knots, and had a crew of 150 officers and men. Albemarle was armed with two 6.4-inch Brooke cannons, each able to pivot and shoot out of three gun ports. Albemarle had a very low silhouette and thick iron plating along her sloped sides, making her a difficult ship to sink. Almost as soon as she was commissioned, Albemarle was sent into action. 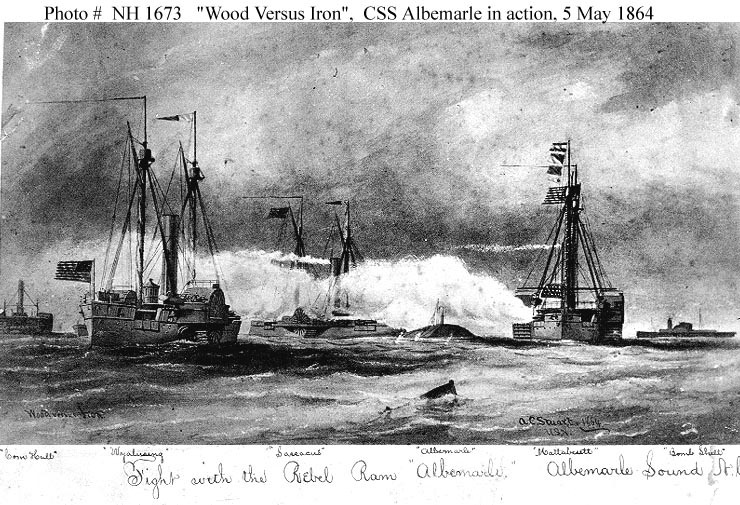 On 19 April 1864, Albemarle attacked Union warships off Plymouth, North Carolina, sinking USS Southfield and driving away USS Miami and two other gunboats. With their waterborne communications severed, the Union Army was forced to surrender Plymouth to the Confederates. Just over two weeks later, on 5 May 1864, Albemarle, accompanied by the steamers Cotton Plant and Bombshell, steamed into the North Carolina Sounds and attacked another US Navy task force, consisting of the “double-ender” gunboats USS Sassacus, USS Wyalusing, USS Mattabesett, the converted ferryboat Commodore Hull, and the small gunboat Ceres. Sassacus made a courageous effort to sink Albemarle by ramming, but she was badly damaged in the process. Albemarle, though, was only damaged lightly during the battle and managed to escape. With Albemarle seemingly impervious to both cannon fire and ramming, all Union warships along the coast of North Carolina were now in danger of being sunk by this ironclad. Something had to be done, and quickly, before the Union’s entire position along North Carolina’s inland waters and coastline was placed in jeopardy. William Barker Cushing was an amazing man. Born in Delafield, Wisconsin, on 4 November 1842, Cushing spent most of his childhood in Fredonia, New York. He attended the US Naval Academy from 1857 to March 1861, when his high-spirited behavior led to his resignation. 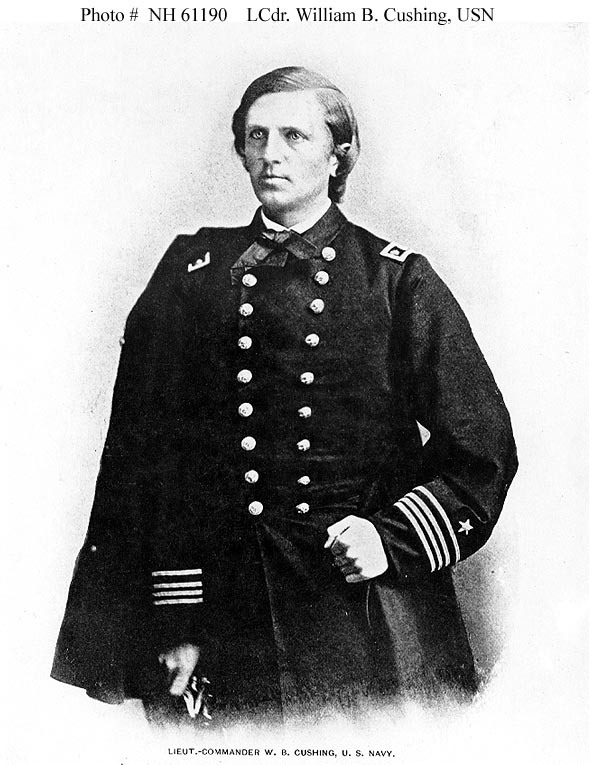 But the start of the Civil War brought Cushing back into the Navy, and he soon distinguished himself as an officer of great initiative and courage. Promoted to the rank of Lieutenant in mid-1862, Cushing served as executive officer of the gunboat Commodore Perry and then was given command of the tug Ellis, which was lost under heroic circumstances on 25 November 1862. He subsequently commanded the gunboats Commodore Barney, Shokokon, and Monticello. During this time, he led several daring reconnaissance and raiding excursions into areas controlled by the Confederates. With the ironclad Albemarle menacing the inland waterways and coast of North Carolina, a daring plan was needed to sink that ship. Cushing came up with a plan. Cushing proposed to take a spar torpedo boat, known as Picket Boat Number 1, and ram Albemarle under the cover of darkness. A spar torpedo was basically a large bomb that was attached to the end of a long pole, or spar. That spar was in turn attached to a small steamboat. The steamboat was aimed at the target and, as soon as it was close enough, the bomb (or torpedo, as it was known back then) at the end of the long spar would be driven into the side of the enemy ship. The bomb was often equipped with a barbed spear at the end, so that it would stick to a wooden hull. The picket boat would then back off, at which point the bomb was detonated by a spring-loaded trigger that was activated by a long cord attached to the picket boat. When the limit of the trigger cord was reached, the cord activated the trigger and the bomb (or torpedo) exploded. The only problem with this plan was that nobody really considered what would happen to the men inside of the picket boat once the torpedo exploded. Considering the fact that the bomb would detonate right next to and underneath the picket boat, the chances of surviving such an attack were virtually nil. None of these problems, though, seemed to discourage Cushing. He was given command of Picket Boat Number 1, along with its crew of 14 men. The steamboat was approximately 45 feet long and nine feet wide and was armed with one 12-pounder howitzer along with the spar torpedo. Picket Boat Number 1 had a top speed of roughly 7 knots and was sent on its deadly (some would say suicidal) mission on the night of 27 October 1864. Cushing took Picket Boat Number 1 up the Roanoke River near Plymouth, North Carolina, and spotted Albemarle. The ironclad was moored to the shore just below the town dock and was protected in the river by a log boom several feet out from her hull. As Cushing approached Albemarle in his little steamboat, he was hailed by some men on board the Confederate warship. Cushing ignored the call to stop and steamed directly toward the ironclad at full speed. At the same time, his boat came under heavy rifle fire. Picket Boat Number 1 hit the log boom but slid right over it, allowing Cushing to drive the spar torpedo into Albemarle below the waterline. There was a huge explosion and the heavy ironclad sank quickly. Miraculously, Cushing and his crew were still alive after the bomb went off. Cushing told his men to jump overboard and try to make it to safety. He and a seaman swam away and succeeded in getting back to some nearby Union gunboats but, except for two men killed, Picket Boat Number 1 and the rest of the boat’s crew were captured. The sinking of CSS Albemarle represented a big setback for the Confederacy and soon after the attack the Union Army captured Plymouth. The town and the area around it remained in Federal hands for the rest of the war. The Union warships on the Roanoke River and along the coast of North Carolina were also free to attack Confederate forces with impunity now that the dreaded enemy ironclad was gone. 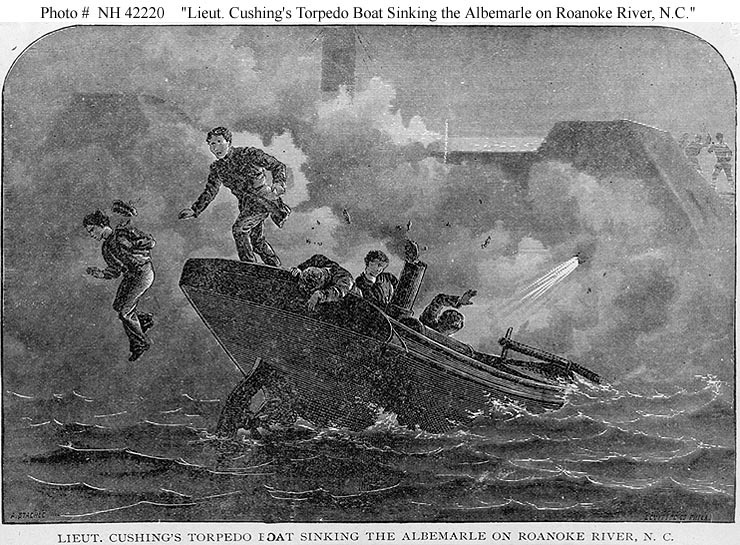 The attack on Albemarle made Cushing a national hero and he was quickly promoted to the rank of Lieutenant Commander. In January 1865, Cushing again distinguished himself in battle by helping to lead the US Navy landing force that captured Fort Fisher from the Confederates in North Carolina. Following the Civil War, Lieutenant Commander Cushing was executive officer of USS Lancaster and commanding officer of USS Maumee. On 12 February 1870, Cushing married Katherine Louise Forbes of Fredonia, New York, and the couple had two daughters, Marie Louise Cushing (born in December 1871) and Katherine Abell Cushing (born in October 1873). Cushing was promoted to Commander in 1872 and was captain of USS Wyoming from 1873 to 1874. In November 1873, Cushing boldly confronted Spanish authorities in Cuba to save the lives of many passengers and crew of the steamer Virginius, which had been captured bringing men and supplies to Cuban revolutionaries. But while serving as executive officer of the Washington Navy Yard at Washington, DC, Commander Cushing’s health declined and he died on 17 December 1874, cutting short a brilliant naval career. After Plymouth, North Carolina, was captured by Union forces, Albemarle was salvaged and refloated. 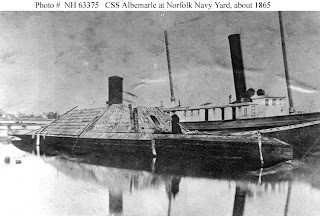 She was brought to the Norfolk Navy Yard at Norfolk, Virginia, in April 1865 and remained there until she was sold in October 1867, probably for scrap. The remarkable saga of Lieutenant Cushing and Picket Boat Number 1 will live in the annals of US Naval history. It showed that small ships had the potential to sink much larger opponents and it also demonstrated the value of this new invention called the “torpedo.” Less than 80 years later, American motor torpedo boats (or “PT” boats), armed with far heavier weapons and modern-day torpedoes, would also attack warships far bigger than themselves, carrying on a tradition that was begun by Lieutenant Cushing in 1864 with the attack on the CSS Albemarle.